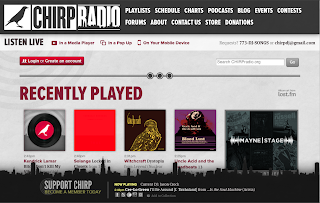 CHIRP Radio is a great, listener-supported online radio station in Chicago and I listen to it often, either on the web or from my iPhone. They recently redesigned their website and it does several things very well. 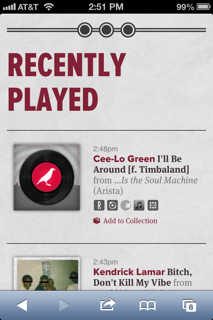 First, the updated visual design engages users with large album art and navigation options. Second, users can now create an account to personalize their experience - you can add your favorite tracks to your music collection, RSVP to upcoming CHIRP Radio events and participate in discussion forums with other CHIRP listeners. Finally, the overall design is mobile-device friendly. They decided to use a responsive design for the site which gives a consistent experience for users no matter what device (web, tablet, phone) they use to access the site. Responsive design uses flexible grids, flexible images and media queries to adjust the layout of the site depending on what device you use. Besides giving the user a consistent experience, it can also save time for developers so they only have to write code once. Above is how the CHIRP site looks on the web and on the right is how it looks on my iPhone. Very nice!